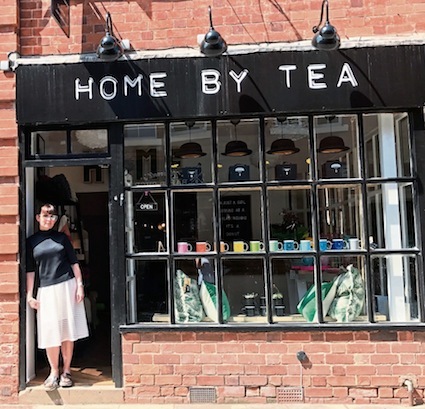 Interior design consultancy, Home by tea, is thrilled to have opened a Home Boutique and Design Studio on King Street in Southwell. Stocking furniture, fabrics and accessories with some big names such as Vita Lighting, Magis and Rice DK alongside cool emerging homegrown brands including Love Frankie, V&C Designs and Lauren Aston. Home by tea has tried to source products, which are fun gorgeous and maybe just a bit useful! The store itself has undergone a full restoration from its previous existence as the Turnaround shop. The back section of the shop also functions as a design studio, where customers can come in, have a sit on the sofa, look at sample books and discuss design ideas all whilst having a cup of tea. Offering a flexible interior design service, Home by tea brings the personal touch and plenty of fun to the process of creating a fabulous home. Run by Tracy Annable, who brings a wealth of experience on a huge range of projects to the table, not to mention a professional design qualification. Tracy has created interiors for everything from modern studio flats, through country cottages to Georgian period properties. As a mother of three (plus two messy dogs), Tracy knows all about creating the ideal balance between a beautiful interior and a functional living space. The process starts with a free initial chat to determine what you are looking for and covers a wide spectrum of services that are tailored to your needs and budget. At its most simple, Tracy will visit your home for 1-2 hours to discuss design ideas for a particular room or just generally for your home for a cost of £50. Further along the scale, a project might involve creating a dream living room from scratch. Starting with a home visit to throw around a few ideas, the process moves on to creating a mood board with swatches of fabric, paint charts, wallpaper samples and flooring options. Then there are furniture ideas, lighting, accessories and soft furnishings to consider. Home by tea can make curtains, blinds and cushions to order and also offers a completely bespoke sofa and chair service – so just about any shape, any size, any fabric! Recently, Home by tea has branched out beyond domestic interiors and into commercial projects and was recently nominated for the Bar and Restaurant Design awards for the design work for Griddle & Shake in Nottingham. If you run a local business, perhaps Tracy could give your premises some serious wow factor. It could be a shop, restaurant, café or bar. Why not call in for a chat. Whether you are in search of that fabulous little something to complete your room, an unusual gift for someone or you want a dream interior creating from scratch, find out what Home by tea could do for you.